Did you live in a high flat in Glasgow in the 1960s and 1970s? 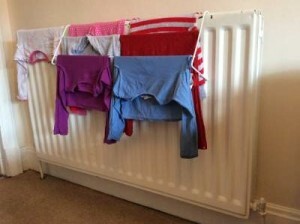 Where did you dry your washing? In 2011 Rosalie Menon and Colin Porteous of MEARU (Mackintosh Environmental Architecture Research Unit), The Glasgow School of Art, published a report entitled ‘Design Guide: Healthy Low Energy Home Laundering’. I’d never even heard of a ‘drying cupboard’! I’d heard of an airing cupboard but never seen one. 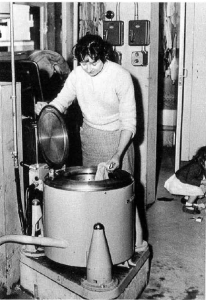 I had forgotten all about these stories in the newspaper until I came across references to electric drying cupboards in high flats in the 1960s and decided to find out more. First let’s return to Menon and Porteous’s report. Their findings are obviously far more complicated than the newspaper reports at the time would suggest (also see their website for further details). Menon and Porteous suggest that air drying washing indoors has both detrimental health implications due to higher moisture levels in the home (increased dust mites and mould spores in the air), but also that it leads to fuel poverty (people turning up their heating to dry clothes while also having the window open). Their research covered all types of homes, owned and rented, houses and flats. Their findings are pretty worrying for those of us passively drying our washing indoors and have given me a lot to think about. Luckily, as environmental architects they have many suggestions to solve these problems, the main one being the provision of dedicated drying spaces such as indoor drying cupboards, covered outdoor drying or communal drying spaces (see pages 30-37 for their design recommendations). Menon and Porteous are obviously interested in influencing current and future architectural housing projects and amendments to existing dwellings, and this is admirable. But I’m thinking as a historian. Menon and Porteous state that in 1963 version of the Building Standards (Scotland) Regulations ‘very clear requirements for clothes drying spaces were defined’. They suggest that ‘the standards were designed initially to tackle health issues and the removal of moisture from the home’ and argue that ‘internal drying cupboards and external drying spaces helped to ameliorate problems of dampness in housing in the 1960s’ (see page 26 of their report). I think Building Standards are one thing; how electric drying cupboards and communal drying spaces and laundries worked in practice in high rise housing in the 1960s is quite another. On the whole, I think it is fair to say that over time, in many high rise blocks, these facilities were not maintained, broke, were vandalised and ultimately were not used. Miles Glendinning and Stefan Muthesius (Towerblock (London: Yale University Press, 1994), p. 67), have suggested that communal laundries were praised by in official government publications as saving labour, preventing steam and condensation in flats and in reducing the space required for drying facilities elsewhere through the use of spinners and dryers. 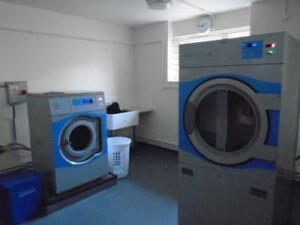 Nevertheless Glendinning states that ‘clothes drying remained a problem’ for those not using communal laundries, and there were many residents who did not like them as they had to book machines in advance, complained of ‘lack of privacy’ and of the fixed charge added to the rent. Drying spaces were to be provided where there were no communal laundries, either in communal drying rooms or in heated cupboards in each flat. One of the main sources that we are using in our project is the ‘Homes in High Flats’ archive held at the University of Glasgow Archives. Pearl Jephcott, a sociologist based in the University of Glasgow, was interested in the social impact of high rise living. Between 1967-69 she and her research assistant Hilary Robinson sent out a team of researchers with questionnaires designed to find out what it was like to live in high rise flats. There are approx. 1,000 questionnaires in the archive. A 24 year old woman living in Netherton Court, Mitchellhill Road, she has two children aged one and five: ‘We can’t hang out washing where we should do, because it gets stolen! The electric dryers have been broken into and we’ve been unable to use them for over a year’. A 59 year old man living in Carnbooth Court, Mitchellhill Road: ‘There were drying rooms with 6d meters in them but the meters were broken into too often that they had to cut off the electricity altogether now. The drying cupboards should have been inside the houses – there is nowhere in the house to dry clothes and we can’t put washing on the balcony’. A 24 year old woman living in Cathkin Court, Mitchellhill Road with a two year old daughter : ‘since we came the dryers have been broken. Other houses have a drying cupboard of their own, which we would prefer rather than depend on the communal one’. A 29 year old woman living in 21 Dougrie Place with two young children: ‘there is no drying facilities at all in this block for washing. For the nappies we need fresh air but there are no drying areas’. She also says that they don’t use the balcony ‘it’s no use for the washing and you’re not allowed to hang it out there anyway’. A 56 year old woman living in 25 Dougrie place: ‘there’s no drying facilities for clothes in the fresh air. There’s no drying greens on top or on the bottom area in this block. The drying cupboard is not enough for a full family wash. There’s nothing like getting them out occasionally’. Nevertheless, many people used their balconies for hanging out washing, although some other tenants did not approve. As one 57 year old woman living in Carnbooth Court suggested ‘It’s like a slum here – every where you go in Castlemilk there’s washing out on all the verandahs. It’s terrible’. I’m not sure whether such drying facilities still physically exist in the remaining high rise blocks in Glasgow and other places, or how they fared over time. Were facilities maintained? Well the communal laundry in at least one block I’ve visited in Motherwell is well maintained and not vandalised, but the caretaker’s office faces the four laundry rooms. I am in no way criticising Menon and Porteous’s report, and the work of the Environmental Assessment of Domestic Laundering Project, far from it. I just wonder if this time around the facilities that would be provided would be maintained. They definitely should be, but the long term maintenance would have to be built into the cost. As the report suggests there would also need to be a cultural change in the way people approach washing and drying clothes. I’d imagine that some people would still be worried about their clothes etc being stolen from communal drying facilities. 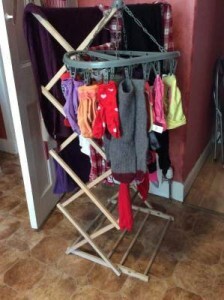 So perhaps internal drying cupboards, ones that would be more cost efficient than tumble dryers, would perhaps be the most successful? Certainly, as was argued in Castlemilk in the early 1970s, communal laundries would provide a focus for social life (The editor of Castlemilk Press suggested in 1972 that ‘People meet and get to know each other in shops and laundrettes – they need shopping and washing facilities’). Also if these facilities were staffed it could ease the burden of housework – but this is an entirely different analysis! And after all this discussion of drying methods, and thinking about how these facilities worked in high rise flats in the past, I really just wanted to know what these facilities looked like in 1960s high-rise blocks. 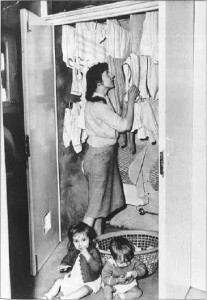 Well I’ve found a photo of a ‘communal warm-air drying cupboard’ in a high rise block in Dundee (Hillside Court, Menzieshill) from 1964 (see Glendinning, Rebuilding Scotland: The Postwar Vision 1945-1975 (Edinburgh: Tuckwell Press, 1997), p. 25 – original photograph credit D. C. Thomson, Dundee). If anyone can remember what it was like to use these facilities in high rise flats in Glasgow and how things changed over time (maybe you use them today? ), or would just like to talk about life in the high flats more generally, we’d love to hear from you.